ADX is part of the Directional Movement System developed by J. Welles Wilder but can be successfully used on its own to signal trend changes and to indicate whether a stock is trending or ranging. A weakening trend is signaled when 14-day ADX turns down while above 40. Note that ADX only indicates trend strength — not trend direction. It may be wise to supplement ADX with a trend filter, whether directional movement or a moving average, to signal direction. ADX above 40 indicates a steep trend, but often precedes a reversal. 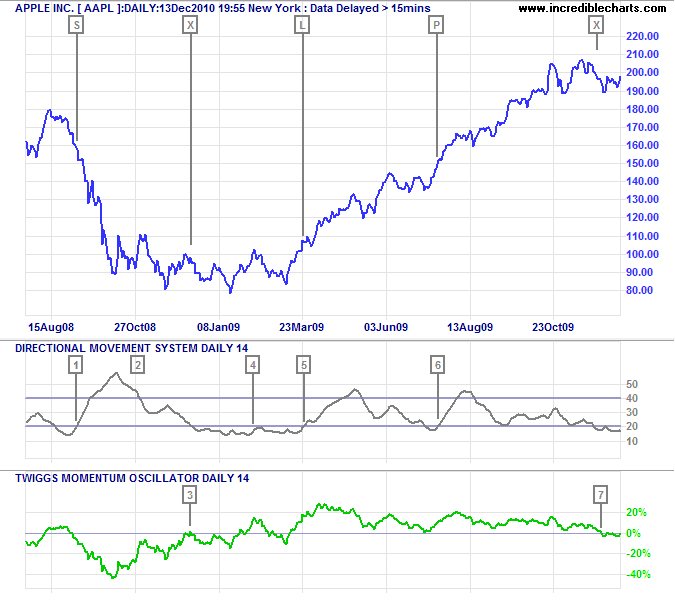 Apple Inc. [AAPL] is displayed with Average Directional Index (14 days) and 14-day Twiggs Momentum as a trend filter. Go short when ADX rises above 20 and Momentum is below zero. ADX down-turn above 40 warns that the trend is weakening. Exit when Momentum crosses above zero. ADX holding below 20 indicates a ranging market. Go long when ADX rises above 20 and Momentum is above zero. Increase position when ADX recovers above 20 and Momentum still above zero. Exit when Momentum crosses below zero. The default ADX period is set at 14 days. See the Directional Movement Formula for details as to how ADX is calculated.